Perched in between the known territories of Ndutu and Seronera, the Moru Kopjes are arguably the most breathtaking scenery the Serengeti has to offer. Surreal rock formations protrude out from the plains and provide cats with a perfect viewpoint to overlook their territories. The Southern Serengeti is most famous for the period between December and March as the migration heads into this fertile grassland to give birth to the next generation of wildebeest and zebra. During these months, vast herds of migratory animals descend upon the Southern Plains – followed intently by a range of predators. When the migration departs, attention shifts back to the Seronera Valley which is well known for its high numbers of resident game and quality game viewing. The Seronera River provides a constant water source and creates a forest region which follows the course of the river creating good cover for the elusive leopard. Strategically placed with easy access to both these regions, Dunia Camp is capable of offering superb game viewing throughout the year. Tucked between the prime wildlife areas of central and southern Serengeti, Dunia Camp combines elements of style and luxury with an incredible wildlife experience. The Great Migration passes through this area that is especially known for its abundance of lion, leopard and cheetah and the rare chance it offers to see the illustrious black rhino. The secluded setting in the Moru Kopjes is a retreat of tranquillity in the most scenic part of the Serengeti. Dunia is a small, semi- permanent camp tucked away in a private location amongst the Moru Kopjes. Strategically placed, it allows access to some of the best game viewing areas available in the Serengeti. Each of the 8 spacious tents features an en- suite bathroom and private veranda overlooking the kopjes. 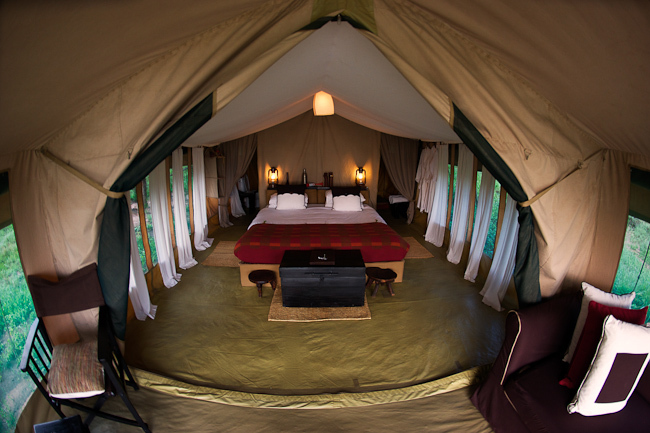 Dunia Camp is made up of superb tents with en-suite bathrooms, large comfortable beds and verandas that make the most of the views across the vast expanse that is the Serengeti. Dunia combines elements of style and luxury with a classic bush feel to create an ideal retreat in the stunning landscape of the famous Moru Kopjes. Together with its sister Asilia camps, Dunia Camp contributes to the conservation of the invaluable Serengeti ecosystem. Supporting responsible tourism inside the park and working on tangible development projects with the communities around the parks, Asilia is playing an important role in the conservation of the most famous wildlife park in the world. Like all Asilia camps, Dunia Camp is proud to be carbon neutral since late 2009. Game drives from Dunia Camp offer an excellent variety of habitats and combine Migration viewing with the search for big cats as well as the rhino - Moru Kopjes currently being the only area in the Serengeti where the illustrious animal can be viewed. Dunia Camp is in the perfect location to enjoy the best of the Serengeti’s game viewing on a year round basis. Half day or full day game drives incorporate many different aspects of the Serengeti – from the rolling plains of the southern grasslands to the rocky outcroppings in the big cat territory Moru Kopjes. Activities such as a once in a lifetime balloon ride or open vehicle game drives from Dunia Camp offer an excellent opportunity to experience different habitats, and combine Migration watching with the search for big cats as well as rhino – Moru Kopjes currently being one of only two areas of the Serengeti (Mara River area in northern Serengeti being the other) where this illustrious animal can be viewed. In camp enjoy board games, swapping stories around the fire, or simply relax with a good book. Dunia’s close proximity to Seronera allows for a memorable balloon safari experience. One of Asilia’s newer properties, Dunia Camp officially opened in mid December 2009 in answer to the need for a permanent camp in the south central Serengeti. Although the structure of Dunia is that of a mobile camp, the attention to detail, spaciousness and luxurious quality imparts a feeling of permanence. Dunia Camp is capable of offering excellent game viewing on a year round basis through access to some of the best wildlife locations the south central Serengeti has to offer. Asilia aspires to be a truly leading company in the industry when it comes to responsible tourism and its impact on conservation and community development. Not leading in terms of its marketing talk, but rather leading in terms of how we behave. Just to be clear: Asilia is a commercial organization; however one with a sincere and strongly developed “eco” agenda. We believe that a conservation and community development will actually be crucial for our long term success, but only if we do it really well and move beyond marketing and window dressing. We are working hard to achieve our aspiration to actually be a leading responsible tourism company. We owe it to our staff and to our shareholders to build a healthy commercial enterprise and the same groups have actively subscribed to this part of our mission.